The story of Koroglu, one of the most widespread of the Turkic destans1 is shared not only by nearly all Turkic peoples, but also by some Iranian and other non-Turkic neighboring communities. In general the versions can be separated into two major groups, the western and the eastern, with the Caspian Sea as an approximate boundary between them. It is generally agreed that the earliest versions are all from the south Caucasus, especially Azerbaijan, and that the destan traveled mainly eastward from there. The earliest dated recorded version, the Koroglu-nama, was written in Persian in the vicinity of Tabriz in the 1840s at the request of Alexander Chodzko, a Polish scholar and diplomat. The manuscript of this Azerbaijani version is one of three versions that are discussed in this paper, the other two being a Turkmen version and a Tajik version. In tracing the transformation of Koroglu's occupation from robber in the western versions to ruler in the eastern versions, it is suggested that there has been considerable influence from the Persian epic tradition. THE STORY OF KOROGLU is one of the most widespread of the Turkic destans. It is shared not only by nearly all Turkic peoples, but also by some non-Turkic neighboring communities, such as the Armenians, Georgians, Kurds, Tajiks, and Afghans. There are, of course, differences among these many versions, but in general they can be separated into two major groups, the western and the eastern, with the Caspian Sea as a rough boundary between them. The earliest written version of this Turkic destan was recorded in Persian near Tabriz in the mid-nineteenth century, and interest in the story still exists in present-day Iran. Versions also exist in other varieties of Persian, such as Tajik and Afghan Dari. Also, as I hope to demonstrate, the Persian epic tradition has had a significant influence on the transformations the destan underwent during the transmission process. So while the destan itself may be Turkic, its roots and its branches are largely within the Persian cultural sphere. (2) the influence of the classical Persian epic tradition in the entire area of distribution of the Koroglu story. The present study aims to demonstrate how these two factors made possible Koroglu's transformation from a robber to a ruler. (2) the Turkmen (GOVSUDOV1980), which is widely acknowledged as a transitional version; and (3) the Tajik (BRAGINSKI 1987) which--not surprisingly--best reflects the Persian epic influence that is also, however, reflected in other versions at the eastern end of the destan's area of distribution. In the Azerbaijani version, as in all the other western versions that stem from it, Koroglu is simply a bandit. This is perhaps the best-known image of Koroglu: he robs merchant caravans and other travelers, kidnaps women and children, and fights the local rulers. He acquired the name Koroglu, which means"son of the blind man, "when his father, who was the chief herdsman for the Khan of Turkestan,was blinded for angering his employer. In selecting a group of prime colts for the shah's own stable, Koroglu's father included two scrawny-looking colts that he knew to be of magical parentage, but he was unable to convince the Khan of their worth and was blinded in punishment. The young Koroglu avenges his father's mistreatment and gathers a band of followers around himself, eventually establishing a fortress- hideout calledChenlibel. According to the stories, Koroglu is a great trickster, attempting (and usually succeeding in) very bold endeavors (e.g., capturing the daughter of the Ottoman Sultan), and having an uncanny ability to evade capture. He often uses clever disguises to achieve his goal and is never recognized, despite his great physical size and his use of his own name as a makhlas (pen-name) in the songs he improvises. But notwithstanding these amusing aspects of his character, he is basically a murderous robber,coarse and even obscene in his manners, holding nothing sacred but his wondrous horse, Kirat (which was one of the two scrawny colts rejected by the khan). This criminal Koroglu was, however, soon transformed in the popular imagination into a hero of the oppressed people, their avenger against the tyrannical local rulers. Eight of these, dated between 1580 and 1585, deal with Koroglu himself. He is indeed described as a daring and amazingly elusive bandit. One document even describes how he and his men, disguised as theological students, robbed a caravan; so the disguise element seems to have some basis in fact. According to these documents, Koroglu was active in the region of Bolu and Gerede in northwest Anatolia; one even says that Koroglu was from the village of Sayik, near Gerede. So the historical Koroglu was quite likely from western Anatolia. Nevertheless, it is generally agreed that the legend concerning him took root in eastern Anatolia and Azerbaijan, where he was active at a later stage in his career, and where his songs are sung even today (SUMER 1987, 9-46). The government documents are mostly orders for Koroglu's arrest, and so they make no mention of his musical abilities. These talents of his, however, are noted by the early seventeenth-century Armenian historian Arakel of Tabriz, who mentions that the songs of Koroglu the Celali ares widely sung by the traditional balladeers of the region, "the Ashiks" (BORATAV1946,38). So it seems that Koroglu's songs were famous within one generation of the bandit's life time. Arakel also mentions several of Koroglu's comrades' names, and says that Koroglu was famous for his tricks (BORATAV1946,194). Later in the seventeenth century, the Ottoman traveler EVLIYAChelebi in his Seyahat-name mentions a bandit named Koroglu in northwest Anatolia (1982 V 18). Slightly later, in the early eighteenth century, the Armenian IlyasMusegyan included some of Koroglu's poems in a collection of songs from the Tabriz area, written in Azerbaijani Turkish using the Armenian alphabet. He also provides some background on Koroglu, noting that he lived in the hills of Kars and Erzurum during the reign of Shah Abbas (1587-1629) in Iran and Sultan Murad (Murad III, 1574-1595) in Turkey (RA'IS-NIYA 1988, 302-303). However, the matter of Koroglu's identity is not quite that simple. Other evidence indicates that there may have been more than one Koroglu in the area at that time. Besides Evliya Chelebi's one reference to the bandit Koroglu, he also mentions a folk-poet by that name twice (see BORATAV 1955, 911; EVLIYVA 283; I, 638-39), without relating the two individuals. It is not completely clear whether the folk-poet Koroglu and the Celali Koroglu of the destan are one and the same person. In his verses, the poet Koroglu mentions having served in the Ottoman army under Ozdemiroglu Osman Pasha in the campaigns in the Caucasus and the conquest of Tabriz. The poetry of this soldier Koroglu is of a heroic nature; especially eloquent is his lament upon the death of his commander. Scholarly opinion is divided on the matter(YILDIRIM 1983, 113),5 but there is no reason why the Celali and the soldier-poet could not be the same person. The dates involved are not irreconcilable, and former Celalis were sometimes pardoned and accepted into the military or government service. (For example, one of Koroglu's associates both in the oral tradition and in the archival documents, a bandit named Deli Hasan, sought pardon and also requested a post in the government. Both requests were granted: he was made beylerbeyi of Bosnia and was sent there together with ten thousand of his followers, and thus he was no longer a menace in Anatolia.) Furthermore, there is some overlap in the names of Koroglu's associates in the archival documents, the oral tradition, and Arakel's history. So the soldier-poet and the bandit were most likely one person. In the documents from the Muhimme Defterleri, however, there is some indication that there may even have been more than one bandit named Koroglu in late sixteenth-century Anatolia. In some of the documents, Koroglu's name appears far down on a list among the names of many other outlaws, as though he were not even a minor leader; in others he is obviously already well-known to all and greatly feared (SUMER 1987, 19-20). There also exists a Safavid document from the early seventeenth century that implies that Koroglu was an employee of Shah Abbas; he captured a traitorous tribal chief and his relatives and sent them to the shah. There is also some evidence of a Turkmen chieftain of one of the Afshar tribes named Sultan Husrev Koroglu who lived in the hills of Kerman and Kiluye at about the same time (BORATAV1931, 96).6 So the name seems to have been a popular laqab (nickname). In any case, it is clear that there was at least one bandit named Koroglu, and he is the hero of the Azerbaijani version. Given the starkness of the prose portions in Persian, one can understand why Chodzko felt a need to reconstruct the story a bit when doing his English translation, but in so doing he managed to distort the image of the rough bandit significantly. Not only did Chodzko conform to the nineteenth-century trend toward glorifying the heroic past when dealing with folklore,9 but it is also clear from his introduction that he had the heroes of the Shah-nama in mind when doing the translation, though he does not equate the two works in terms of quality (CHODZKO 1842, 4-6). The result is that sometimes Koroglu's words (and even his deeds) appear much nobler than would be appropriate for a crude outlaw. Koroglu here is closer to the bawdy Rostam of Obayd-e Zakani's Akhlaq al-Ashraf than to any hero of the Shah-nama (cf. SPRACHMAN1995, 58, 60). So the romanticization and Persianization of Koroglu's character had a small beginning even in this very first translation of the stories. Here is just one brief example of Chodzko's tendency towards embellishment and exaggeration: During Koroglu's encounter with the ruler who blinded his father, the ruler notices Koroglu's horse. In his English translation, Chodzko writes that the prince was "captivated by the uncommon beauty of the horse, as well as by the noble appearance of the rider..." while the original says simply: "The khan's eye fell upon the horse" (chashm-e shah bar asb oftad). Chodzko's translation also includes some outright errors that serve to exaggerate Koroglu's greatness: e.g., at one point he renders beg ("lord, master") as "god," presumably lapsing for a moment into his native Polish, where bog means "god" (CHODZKO1842, 22-27; SADIQ 1842, 4-6). It is only logical to assume that the Turkmen played an important role in this eastward movement of the destan.The Turkmen being a partly migratory population with a presence on all shores of the Caspian Sea and into Central Asia, stories of Koroglu could have accompanied them on their comings and goings, which would have been a much more rapid and effective means of spreading the story over a wide area than if it were being carried by only a few wandering minstrels (BARTHOLD 1934). Furthermore, Koroglu himself is acknowledged in most versions (both eastern and western) to have been a Turkmen of the Teke tribe, though the destan is not confined to the Teke tribe alone. The Turkmen version of the destan does indeed include several features that can be considered transitional between the western and eastern groups. It is written in a western Turkic language (Turkmen being of the Oguz group, together with Azerbaijani and Ottoman), but in many other respects it resembles the versions of the eastern group. As in most eastern versions, the hero's name is Goroglu, "son of the grave", as he was miraculously born after his pregnant mother's burial. But in this Turkmen version, the meaning of "blind man's son" is also retained, as the hero's grandfather (Cigaly Beg, who in some variants is his father) has been rendered blind by some injustice. Both meanings of the hero's name have given rise to theories about the origins of the destan, as one or the other of these motifs (i.e., either blinding over a horse dispute or miraculous birth in the grave) occurs in numerous earlier legends within the destan's area of distribution. Goroglu can be both the ruler of his own people and the robber of others. This dual aspect of the Turkmen Goroglu's occupation, in my opinion, marks an important turning point in the development of the destan. As has been said, the distinction between Koroglu the bandit and Goroglu the ruler has been a basic criterion in categorizing the versions, but the distinction is, to some extent, a false one: any bandit with sufficient power may be in effect a ruler; and a ruler with sufficient power may behave like a bandit if he so chooses. Goroglu's role as chieftain and the tribal setting in which that role occurs make it clear that power is the crucial element, and what form it takes is rather secondary. In any case, the Turkmen version represents an important step in transforming the rough bandit Koroglu into a kingly character. In the Azerbaijani version this supernatural element was almost totally absent, but in the Turkmen version Goroglu marries fairies, for example, instead of princesses, and he has powerful allies such as Ali, Khezr Elyas, the Forty Pirs, etc. He sometimes can hardly manage a simple kidnapping without assistance from some deus ex machina, whereas the Azerbaijani bandit Koroglu is quite earthly and selfsufficient. A brief comparison of one episode that occurs in both of these versions and, in fact, in almost all other versions as well will help illustrate these differences. Koroglu has an encounter with a powerful and wealthy bezirgan (merchant); the two men struggle for a long while, the bezirgan being Koroglu's equal in strength; finally the bezirgan defeats Koroglu and sends him away. However, a little later the angry Koroglu returns quietly, and kills the bezirgan with an arrow in the back. In the Azeri version, that's about all there is to the story,except that after killing the bezirgan,Koroglu also strips him naked and is pleased to discover that this capable fighter was not a Muslim, but an Armenian. The Azeri Koroglu being a fervent Shi'i, he would not want to admit that a despised Sunni could have been such a worthy opponent. Koroglu takes the merchant's possessions and leaves, feeling no compunction whatsoever about having killed him in a cowardly manner. In the Turkmen version, Goroglu's wife, Aga Yunus Peri (a fairy), challenges him in the presence of others to ride out to collect the toll from the mighty bezirgan.Thus, it is a matter of honor as well as profit to deal with this merchant. Again, the two men fight, but then they agree to be brothers. On his way home, Goroglu meets a kampir (an old sorceress) who tells him that the bezirgan will come and plunder Goroglu's household if left alive. The superstitious Goroglu believes this and returns and kills the bezirgan with an arrow in the back. Before dying, the bezirgan asks Goroglu (who has apologized) to look after his younger sister, Aysultan, and the remorseful Goroglu agrees. Feeling very guilty, he builds a commemorative dome over the bezirgan's grave. When the lovely Aysultan hears of her brother's death and appears on the scene dressed as a warrior to avenge him, Goroglu shows her the memorial dome, admits his crime, and offers her his dagger as her weapon of revenge. She pardons Goroglu and ultimately marries one of his heroes. The story ends with a great wedding feast being held in their honour. So in the Turkmen version Goroglu is no longer an irreverent bandit operating as a free agent. He takes matters of honor seriously and acknowledges and fulfills his responsibilities, acting more like a ruler than a mere robber. Though the tribal setting is the reason for this feature of the hero's character, and not any direct influence of the Persian epic tradition, the Turkmen Goroglu still can be said to have facilitated the further development of the Persianate courtly hero from the Turkic popular hero. The supernatural elements, the genealogy, and the neat completeness of the story-even ending as it does with a wedding in the usual manner of folk tales- are typical changes in the later stages of folk destans. This brings us to the third version we wish to consider, the Tajik Gurogli. In the most recently published Tajik version, based on the narrations of three Gurogli-khwans (reciters of Gurogli tales), there is no separate episode devoted to the encounter with the bezirgan. Merchants do indeed appear in the stories, sometimes as visitors to the court of Gurogli Sultan (as he is called) in the mythical kingdom of Chambul-i Maston. One visitor with evil intentions even tries to gain admittance to Chambul-i Maston disguised as a bezirgan, which would be a very unwise way to approach the bandit of the Azeri version. Gurogli here is indeed a sultan, so much so that he hardly does any of the fighting himself. He is much more involved with bazm (feasting) than with razm (fighting); he does still sing, but he has become more of a Key Kavus than a Rostam. He rules his kingdom with wisdom and justice, assuring protection from foreign invaders, sitting enthroned while his adopted son Avaz (who appears in all versions, though not so prominently) rides out like a knight to deal with challengers to Gurogli's power. In Tajikistan the Gurogli stories are also recited in a manner similar to that used in some Shah-nama performances--a solo performer singing in a roughened voice and accompanying himself on a stringed instrument. The Tajik Gurogli was not scientifically studied or published until the 1930s, although the story is thought to have existed among the Tajiks since the second half of the eighteenth century (BECKA1989, 380). So the story of Koroglu, which in its eastward progress had lost some of its heroic features, gained a fresh infusion of epic elements from the Persian tradition in the Tajik version. This is not surprising in a region where the Shah-nama tradition was so firmly entrenched that even the common people expected a courtly cast of characters in a heroic tale. This is not to imply, of course, that the Shah-nama has no influence in Azerbaijan. 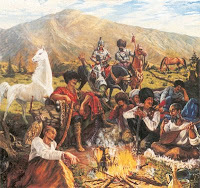 But Azerbaijan was the scene for at least some of the historical events upon which the destan is most probably based, and it was there that the legend of the bandit Koroglu took root very early and lasted until the present day. In Azerbaijan the bandit could not easily become a king. In Central Asia, far from its point of origin and having undergone transformationsin the transmission process, the destan was ready to accept a royal hero. 1. Regarding the term destan (Persian, dastan): While destan is often translated as "epic," both "epic" and destan are really very imprecise terms and are not exact equivalents. The question of what constitutes an epic has been debated since the time of Aristotle, and the many versions of the Koroglu story vary in how well they fit the suggested criteria. Also, destans can be of many types; see, for example, the table of contents of Zabihollah SAFA's study of the Iranian epic (1955), where many subtypes of destan are listed. Pertev Naili BORATAV, the pioneer in the study of Koroglu, vacillates in his many writings over the years (1939, 1943, 1955, 1964) as to whether or not Koroglu qualifies as a destan and whether or not a destan is an epic. In the present paper, although destan can be loosely translated as "folk epic" or "popular oral heroic tale," I have chosen to retain the native term for this genre for the reasons given by Karl REICHL in his Turkic Oral Epic Poetry(1992): many subgenres of destan are possible, and the native term differentiates destan most clearly from other types of tales (masal, hikaye). Thus destan is as inclusive and as exclusive as it needs to be, while "epic" is not specific enough. 2. The question of the origin of the Koroglu destan is still far from settled. Although the historical evidence is inconclusive, the scanty facts that do exist have become the basis for rival claims to national possession of the Koroglu destan,the most plausible of them being made by Anatolian Turks, Azerbaijani Turks, and the Turkmen. In short, the situation is this: the best-documented prototype for the hero is the bandit from northwest Anatolia (SUMER 1987); the earliest recordings of the destan are all from the Caucasus, primarily Azerbaijan (BORATAV1931, 21; CHODZKO 1842; TAHMASIP 1969; EVLIYEVA 1990; and many others); and the hero in many versions is said to have been a Teke Turkmen. Thus, Anatolian Turks point to the Bolu region as the birthplace of Koroglu, while others point out that there were many Turkmen living in the Bolu region at the time (MEMMEDYAZOV 1982, 38-39, describing the viewpoint of Azeri folklorist X. G. Koroglu); and a major Azeri folklorist (Tahmasip), while conceding that the destan may have originated among the Turkmen in the Caucasus, insists that these Turkmen spoke Azeri and practiced Shi'ism at the time the destan arose (RA'IS-NIYA 1988, 107). A few scholars still insist that the destan arose in Central Asia and traveledwest from there (YILDIRIM 1983), a view once very popular, but now largely discarded by folklorists (MEMMEDYAZOV1984, 25). 3. HOLT(1982, 10-11) discusses how even Robin Hood does not fit the mold of the idealized sort of bandit envisioned by HOBSBAWM(1969) and others who subscribe to the idea of "noble banditry. "Koroglu does not conform to this notion any better than other real-life bandits do (BLOK1972). Koroglu's later idealization is the result of a process involving romanticism, nationalism, and various political currents in the areas where the story is known. An especially strong criticism of the Turkish idealization of Koroglu can be found in KAPLAN 1985, 101-11. 4. Celali (i.e.,Jalali) refers originally to the followers of one Shaykh Jalal, who led a rebellion against the state in 1519. Although this rebellion was effectively put down, the term was later applied to members of any group that caused trouble for the state, and it continued to be used throughout the sixteenth and seventeenth centuries. 5. Again, Dursun Yildirim is in disagreement with many others on this issue. He finds it hard to reconcile the personalities of the hero and the folk poet. (Lessons in Turkish history). Also, Rahim RA'IS-NIYA (1988, 152), cites a sixteenth-century Persian-language history that mentions this chieftain: Ahsan al-Tavarikh by Hasan Bey Rumlu. 7. For further information on Chodzko, see also Jean CALMARD1983, 502-504. 8. Some indications in the manuscript of the Kuroglu-nama lead me to believe that Chodzko's Turkish was not very good. There are interlinear translations of the Turkish songs, and also numerous glosses of Turkish words into Persian, French, or Chodzko's native Polish. 9. FINNEGAN1979, 31-41, contains a good discussion of the shortcomings of the romantic and evolutionist theories of oral poetry. 10. The dissenting opinions are discussed in note number 2 above. 11. See also Braginski quoted in KARRYEV(1982, 76). Dursun Yildirim(1983, 113) doubts that the bandit and the khan could have developed from the same character.He contends that the eastern and western versions arose side by side. 12. Memmedyazov comments here on the prevalence of tribal features in the Turkmen version. HOBSBAWM(1969, 14) also has some interesting observations on the different perspectives on banditry that exist in tribal societies. 13. Faruk SUMER(1987, notes) mentions that, among the forces fighting in Syria during World War I, the Arabs sang songs of Antar, while the Turkmen sang songs of Koroglu. 14. This is similar to the process described by HANAWAY (1978,91-93),where he discusses the later transformations of Shah-nama stories into romances. A similar case is described by J. A. Ross (1980, 90) in discussing Old French chansons de geste. 15. See also BERDIEVA 1991,330. The Tajik author of this article sounds just as possessive of the Gurogli dastan as any Turkic scholar: "Some of the people of Zarafshon and Fargona regard Gurogli as belonging to the Turks, some of the people of Khatlon ascribe the shashmaqom [classical musical modes] to the Uzbeks, whereas both of these belong to our nation, both shashmaqom and Gurogli." 16. Those who regard the Tajik Gurogli as syllabic include CEJPEK (1968, 634); BRAGINSKII et al. (1987, 44); ASRORI and AMANOV(1980, 260); Beliaev, as cited in REICHL(1992, 327); and HISOMOV1980. 17. See BRAGINSK et al., 1987,43-44. CEJPEK(1968,634), however, sees the entirely versified forms of the Tajik Gurogli as evidence of the Persian preference for metrical epics. A preference for end-rhymes in the Tajik version has been noted by several scholars, e.g., BRAGINSK et al. (1987, 44) and ASRORI and AMANOV(1980, 260). Stress patterns have also been suggested as a clue, with musical accompaniment being a crucial element, and a possible relationship to pre-Islamic Persian epic verse meters has been discussed. Such meters may have been a step in the development of the Persian meter motaqareb (BRAGINSKet al.,1987, 44). Gilbert LAZARD(1994, 82, 86) has suggested something similar regarding the oral epic verse forms of the Baluch. On the other hand, arguing against a Persian source for this unusual meter, Walter Feldman has pointed out (in a personal communication) that some of the most archaic Turkic epical works (Dede Korkut or the South Siberian epics) also employ uneven syllabic verse, and the Tajik meter also bears some resemblance to the zhir form from Uzbekistan, so the influence need not be from the Persian epic tradition. 18. I was told by Walter Feldman in a personal communication that this jeering also occurs in some Uzbek versions.